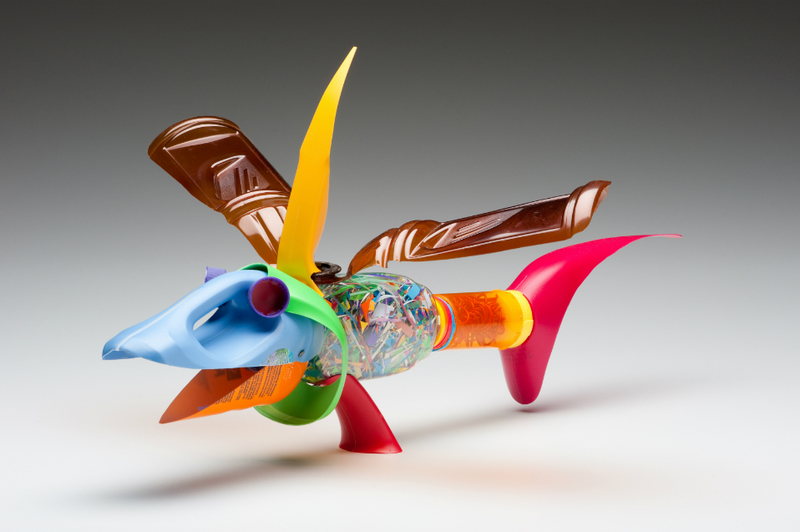 Meet David Edgar: our visiting artist from Landrum, South Carolina. As a sculptor, Edgar’s work has always been strongly informed by the 20th century tradition of found object assembly. After focusing on formal constructivism sculpture in fabricated steel for over 30 years, he began making decorative artworks from recyclable detergent bottles. With the quality of craft as an important issue for Edgar, he finds making recycled plastic art energize his creative spirit. 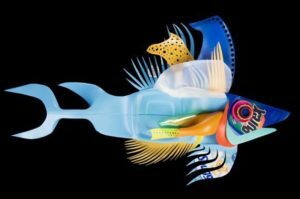 One of the results of his exploration with the material of recycled plastics is the marine creatures of the Plastiquarium. The Studio is excited to have Edgar as one of our fall 2018 visiting artists. He will be teaching the workshop, “Fantastic Recycled Plastic“, on Saturday, November 3, 2018. Join Edgar in the studio and explore techniques to upcycle consumer-based recycled materials into decorative artworks! CC: What drew you to use recycled plastic as a medium? David Edgar (DE): I suppose I have been a scrounger since childhood with found objects being a staple of my materials. It was serendipity that colorful plastic laundry product containers just popped up like mushrooms when I wasn’t looking and the match was made. CC: Can you tell me about your creative process? DE: For the most part, my creative process is a constructivism technique with fabrication and substitution. I tend to visualize a deconstruction of a bottle and go from there. In some ways, it is much like working with leather, just imagine an empty plastic bottle as an animal skin with no animal inside it. I tend to avoid using adhesives in most cases and prefer to use mechanical fastening systems like pop rivets, staples, and machine screws in my work. CC: What is your favorite thing about working in plastic? DE: The properties of the post-consumer material are really stimulating, particularly the “focus group approved” colors used by corporate marketers to beguile the consumer. Additionally, plastic is lightweight, quiet, durable, fast, easy, fun, safe, and a free material. CC: How have current environmental issues influenced your work? DE: The environmental impact of plastics in our world is ever present. Many people tend to overlook that plastics are petrol-chemical materials made from petroleum, which is actually fossil geologic deposits (think squashed dinosaurs). I want to think about how the fossils of future epochs might look. You can find more expansive text on this topic on my website www.plastiquarium.com. 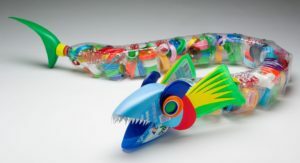 Here is a video showing how Edgar put together a simple fish sculpture with recycled plastics. Don’t miss the “Fantastic Recycled Plastic” workshop to learn how to make big and small creative reuse art projects, tips and tricks, and the proper tools to manipulate plastics with an experienced artist! Are you a teacher working with youth and teens? 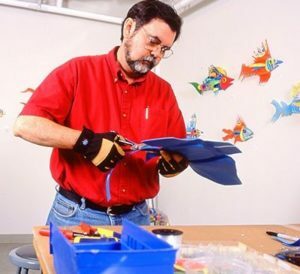 The “Fantastic Recycled Plastic” workshop with Edgar is the perfect one to inspire project ideas and processes that you can incorporate in your teaching. Recycled plastics are accessible art materials that is easy to work with in a classroom setting and its secondary content can fit perfectly into your curriculum. Contemporary Craft’s Visiting Artist Program is supported by the Windgate Charitable Foundation.